Rupert Pupkin Speaks: Underrated '55 - Jerry Entract ""
I don’t really know whether this film qualifies as ‘under-rated’ because I don’t know how well-known it is outside the UK. But if my listing it provokes a few readers out there to go and discover it, then job done! 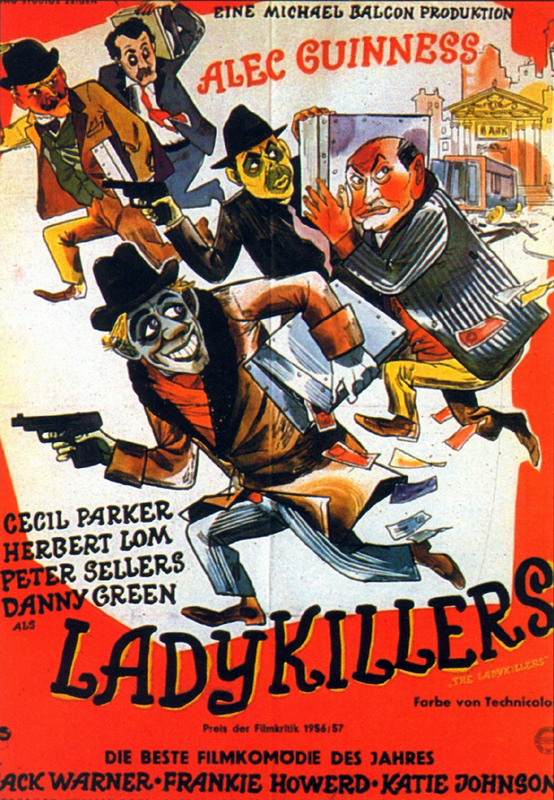 The last great “classic” comedy from iconic Ealing Studios, this was a terrific black comedy heist movie. A group of crooks move into the boarding house of a meek little old lady while they plan a daring London heist. As the plot unfolds the crooks are gradually “wiped out” unwittingly by the old lady. The cast is classic and Alec Guiness in particular shows his total grasp of wonderful characterisation. Laugh-out-loud hilarious and not to missed!! Readily available on DVD as part of “The Ealing Collection”. A fast-moving suspense thriller from the Rank Organisation and filmed in glorious Eastman Colour. A well-heeled young couple’s baby is snatched from her pram in a London street. The hunt is on! A race against time for the police (headed by David Farrar) and the young parents as the film reaches its climax on Beachy Head atop the white cliffs of Dover. Quite a classy film actually with good playing by the cast and some nice London location shooting. Unfortunately the film is not available on DVD. Well worth looking-out for if it turns up on TV. The cast alone would sell this film to me. Two fine tough guys sandwiching the luminously beautiful Peggie Castle. Lovejoy plays an ex-con who goes undercover for the feds to “finger” the crime czar (Tucker) who turned his sister into a drug addict. The film is tough and gritty ,especially for the time, and thoroughly recommended IF you can find a way of catching it. Sadly, like many great little movies put out by Allied Artists it is not available on DVD. OK – this western is “under-rated”? No Way, I hear you say!! 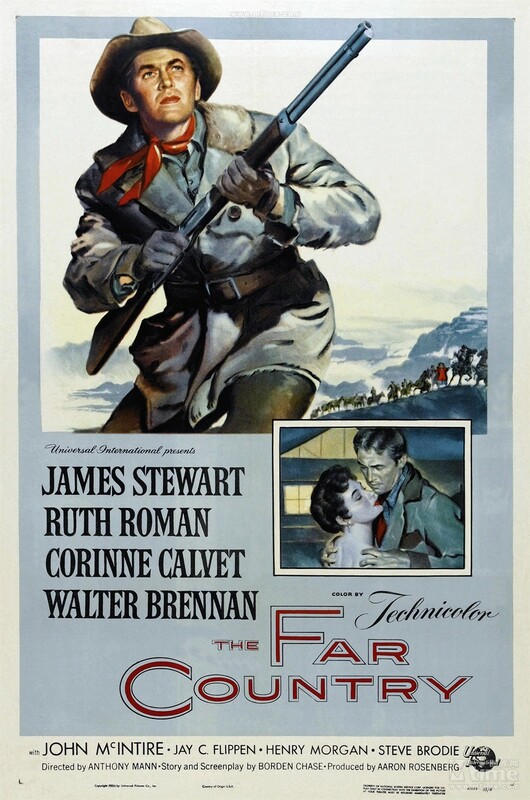 Mann’s great series of classic westerns with Stewart are, of course, highly-rated. BUT I am making a personal point here. Of the films made this one is generally considered the least of them, it seems. I would heartily disagree (I rate it over “The Naked Spur” certainly) and think it deserves a place near the top of the list. The story, like many of the best westerns of the time, is one of redemption set in the Klondike gold rush. Stewart’s character is pretty self-serving to start with until the shock of losing his best friend makes him see the light. William H. Daniels Technicolor photography of the Athabasca Glacier in Canada is breathtaking and the film, for me certainly, one of my favourite westerns. Happily this one is readily available on DVD. No western fan should not know it intimately! When it came to tough action westerns made the way they should be, Allied Artists delivered and the director, Lesley Selander was the maestro. Sterling Hayden made a series of low-budget westerns in the 50s, this one being a higher budget than someand one of the best. The film is no classic but will entertain most hardened western fans. It is tough and violent and De Carlo’s character not treated with kid gloves exactly. Another Allied Artists film not available on DVD on its own in the USA sadly. I really like the sound of LOST, Jerry - thanks for flagging this one up. Also, it's good to see more love for SHOTGUN being expressed. I think it highlights Hayden's and Selander's strengths pretty well and gives a fair idea of what one can expect from their respective movies. I just watched another Selander movie, DAKOTA LIL, the other evening and that toughness is apparent there, just in a slightly different way. Now, on THE FAR COUNTRY, I kind of agree with you and disagree at the same time. It does seem to get less respect than other Mann/Stewart vehicles so your inclusion makes sense in that regard, I tended to underrate it myself at one time. However, I wouldn't rate it above THE NAKED SPUR. I still feel that one is at or near the top of the Mann/Stewarts - tight pared down and powerful. Of course it's great that these guys' body of work is so strong that we have the luxury and entertainment of arguing over their relative merits. Thanks for leaving your thoughtful comments, Colin. Yes, one of life's real pleasures for me now is hearing the views of other like-minded film enthusiasts and discussing merits or otherwise of that great body of work we can all watch in the comfort of our homes! How lucky. 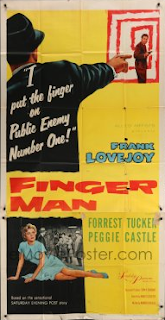 Nice to see some love for FINGER MAN from the VERY underrated Harold Schuster. hundreds of Spaghetti's,all the Peckinpah's and Tatantino's. TOO much to take in that one. THE MAN FROM LARAMIE at two and I guess THE FAR COUNTRY third. sold to Republic (now owned by Paramount) decades ago. Olive Films could get the rights to these two if they chose to do so. Republic Noir with the great Marie Windsor. Sorry about the mis-spelling of Q.T's name on the above comment. that I am actually looking forward to! Thanks for your in-depth comments too, John. Muxh appreciated! I wouldn't argue with your Mann/Stewart listing order though I would also want "BEND OF THE RIVER" in there high up too!! Fancy "NO MAN'S WOMAN" being the support to "THE LADYKILLERS". I didn't know that as my first viewing of the main feature was on a re-release at the Harrow ABC Dominion (I believe) in the early 60s. Let's face it guys, there's no such animal as a weak or poor Mann/Stewart western. All of them are essentially superior and the only thing is which one or ones appeal to us most. And, as I said above, this really is a very happy dilemma to find oneself faced with. Colin puts it well re the worth of the Mann/Stewart films. In terms of which ones appeal to me most, my list would start off as 1) WINCHESTER '73, 2) BEND OF THE RIVER (pure "movie comfort food" for me) and 3) THE FAR COUNTRY, followed by THE NAKED SPUR and THE MAN FROM LARAMIE. I admire them all but tend to prefer those in which Stewart isn't quite so miserable, though he's intense in all. Really glad to see the love here for THE FAR COUNTRY which I bought as soon as I saw it at UCLA last year. Great to see more exposure for SHOTGUN and Lesley Selander's work. Never heard of LOST...hope to see FINGER MAN very soon. A great list! Thanks for taking time out from the nuptials to leave a nice, thoughtful reply, Laura. That's really appreciated. It's great that I managed to kick up the dust of discussion over the merits of the Mann/Stewart westerns even though I knew that, in truth, none of them is underrated really. Had a feeling no one would know of "LOST". Well worth seeking out (if possible).